Susan Freudenthal, born Gertrud Suse Kahn, was born and raised in Nuremberg, Germany. With the rise of the Nazi party, and most especially their place in the government starting in 1933, her family felt anti-Semitic feeling everywhere they went. The family belonged to a liberal Jewish congregation, and two members of the family were liberal rabbis. Her father was arrested for the first time in 1933 but it would not be the last. When it was time for Susan to begin her high school education Jews were already forbidden from attending school with non-Jews. This in conjunction with her father’s new and old metal business being unable to function because of boycotts against Jews, the family moved to Leipzig. Once in Leipzig the family’s lifestyle changed dramatically. Having lived a German middle-class lifestyle with household help and a chauffeur, they now moved into a large apartment and had a couple who worked for them. The woman worked days and her husband acted as chauffeur as long as they were able. Susan’s grandmother, a diabetic, had also moved to Leipzig and this same woman worked hard to find fresh fruits for her. Even after it was illegal for the couple to work for the Leipzig family, the woman would often come by to help with the cleaning. The couple had a daughter who had Down’s syndrome and had been placed in an institution. She was one of the first to be liquidated by the Nazis in their T4 program, leading her parents to hate government and especially the Nazis. Susan’s uncle, her mother’s only brother, immigrated to the United States in 1936. He recognized early on that the treatment of Jews was only going to get worse. His decision would save Susan’s life but not yet. 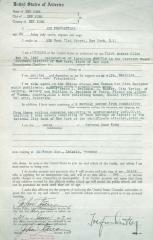 By 1936 Susan had climbed the ranks in a Zionist scout troop and had dreams of immigrating to Palestine. Her parents were also sympathetic to the cause and believed that if they left Germany that Palestine was the only choice. But, after graduating from high school in May 1938, Susan left for the United States because her uncle was able to send an affidavit which allowed her to receive a visa. Susan’s parents also managed to get her brother out of Germany by sending him in April of 1939 on a children’s transport to England. Once war broke out between Germany and England he was shipped off to a camp in Canada where he had the fortune of some wonderful Jewish people who helped him receive an education. Susan’s parents and grandmother were not so lucky, all three died during the war. 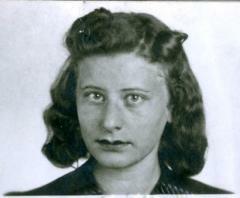 Her father died in 1941 or 1942, her mother in Auschwitz and her grandmother in Theresienstadt. When Susan arrived in New York her uncle and aunt were going through a divorce and she only lived with them for three weeks before becoming a live-in nanny for a Jewish family. It was while she was working for this family that she met, for the second time, a second cousin who would become her husband, Herman, in 1941. 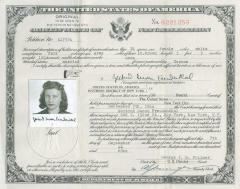 Susan became a U.S. citizen in 1944. Susan and Herman lived for a number of years in New York until Herman’s job had him constantly traveling between New York and the Midwest. It was at this point that Susan and Herman realized that life in America could be very different than their experience in New York. They chose to move to Cincinnati in 1950 after looking at various cities because they had friends, Manfred and Flora Rabenstein, in Cincinnati. Manfred and Herman had grown up together in Germany, and even though Manfred was the rabbi at the Orthodox Germany congregation, Susan and Herman joined because of their friendship. Herman died in 1987. Susan is still living in Cincinnati, Ohio. Much of this biography is drawn from the chapter “They Were All Uprooted” by Susan Freudenthal in the book Queen City Refuge: An Oral History of Cincinnati’s Jewish Refugees from Nazi Germany Edited by Abraham J. Peck and Uri D. Herscher.